Enjoy the comforts of well-equipped campsites at both ends of this stretch of trail. And in between these two points, a true wilderness experience is waiting for you. Sometimes there is only the silence of deep forest; other times the sounds of rushing rapids, a bird call, the splash of a fish, your own footsteps. 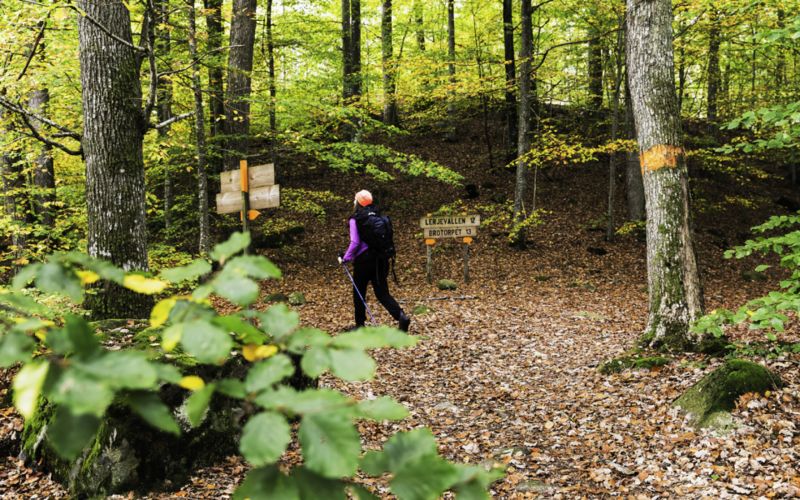 Follow footpaths, forestry tracks, and boardwalks, over rolling hills and dales through deep, deciduous forests. You will also climb the odd fence into grazed woodlands. At the starting point, spend some time at Östafors Campsite, which is well-equipped with a wind shelter, grill area, a supply of firewood, fresh water and toilets. The word “fors” in Swedish means rapids, and true to its name, the Holjeån River divides near the campsite forming two natural waterfalls roughly 100 metres apart and with a total drop of about 10 metres. Birdwatchers should keep an eye out for grey wagtails and kingfishers. The rare royal fern (Osmunda regalis) grows here as well. Cross briefly into the county of Blekinge along a narrow boardwalk and then back into Skåne along a winding footpath. Between the trees, you catch glimpses of Raslången Lake. 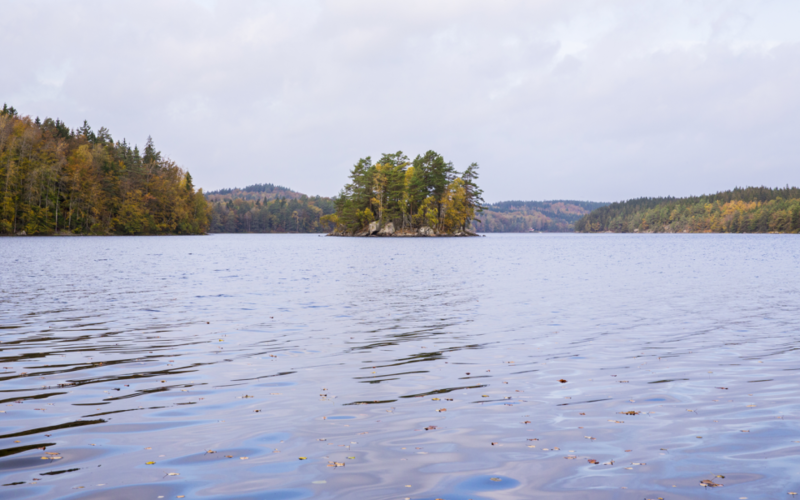 This narrow lake with its islands lends its name to the Råslångan Ecopark, the southernmost ecopark in Sweden. 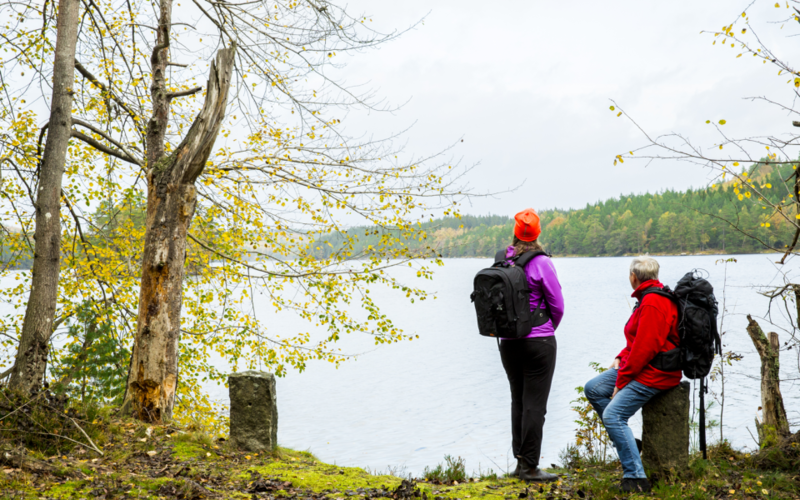 On a narrow stretch of land, your footsteps carry you between Lake Raslången and little Nejlikesjön Lake. In summer, you can drink in the scent of bog myrtle as you pass through. One of the most beautifully positioned camp sites along the Skåneleden Trail is at Bökestad, at the southernmost tip of Råslångan Lake. The campsite is equipped with two wind shelters, four grill pits, toilets and water (must be boiled before drinking). Even as part of a larger group, you can stay here quite comfortably. Why not rent a canoe and explore the lake from the water? At times the silence along this trail is powerful. At other times, you have the seasonal sounds of nature. Such a deep wilderness experience is rare in this southern part of Sweden. Once upon a time, an entire industrial complex with associated housing was built up around the rapids at Östafors. There was a sawmill, a blacksmith, several flour mills, a power station and a nail factory here. This came to an end in the late 1960s and most of the factory buildings were demolished. The dam at the old power station was removed in 2007, so fish could once again swim upriver. Two wooden crosses, one along the trail and the other a couple of hundred metres southeast, serve as a memorial to a duel fought here long ago. According to local folk legend, identical twin brothers fell in love with the same girl and duelled for their beloved. With 200 meters between them, they raised their weapons, fired at exactly the same moment and with equally accurate aim killed each. When the girl found out what happened, she was so shocked that she fell into the river and drowned. The Skåneleden Trail and the Blekingeleden Trail converge along this section. At the county boundary between Skåne and Blekinge, try to find the old charcoal kilns, difficult to spot for the untrained eye. Charcoal production was an important source of income here in the 1900s and smoking kilns were a common sight in the forests. Huge quantities of timber were transported through Raslången Lake. The timber was steered by raftsmen using oars.